Heading to Royal Ascot? Join us for some post racing cocktails! The Royal Meeting is a whirlwind of excitement and colour. Each day has its own personality, interspersed with six top-class races. Royal Ascot is anticipated and revered, and these five days are made for socialising. Long seen as a spectacle of fashion and style, the meeting is broadcast to audiences around the globe and to experience it in person is even more special. Our fabulous Events Team at The House are all ready to join the fun this week, if they manage to escape Beaufort House, where parties and event planning obviously takes first priority. 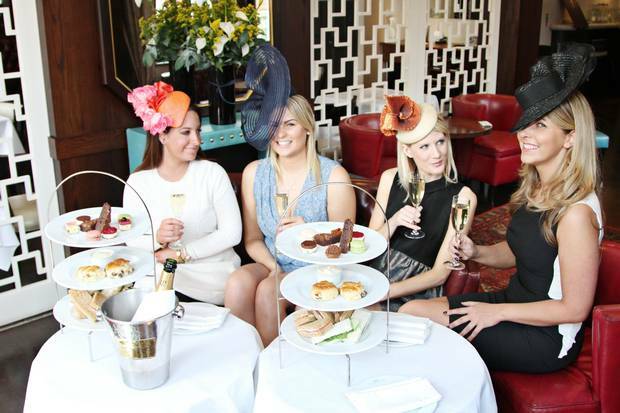 Here the team can be seen modeling hats by their favourite Jane Taylor Millinery designs while enjoying a glass of bubbly with their Afternoon Tea in our Members Lounge on the 1st floor of The House. If you are going to enjoy the thrills of Royal Ascot this week then why not join us at The House when you return to London and continue socialising at Beaufort House Chelsea. Prolong the day that little bit longer, show off your stunning outfits and beautiful hats for a few hours more with some cocktails or a glass of Champagne or two at the Best Cocktail Bar in South West London.